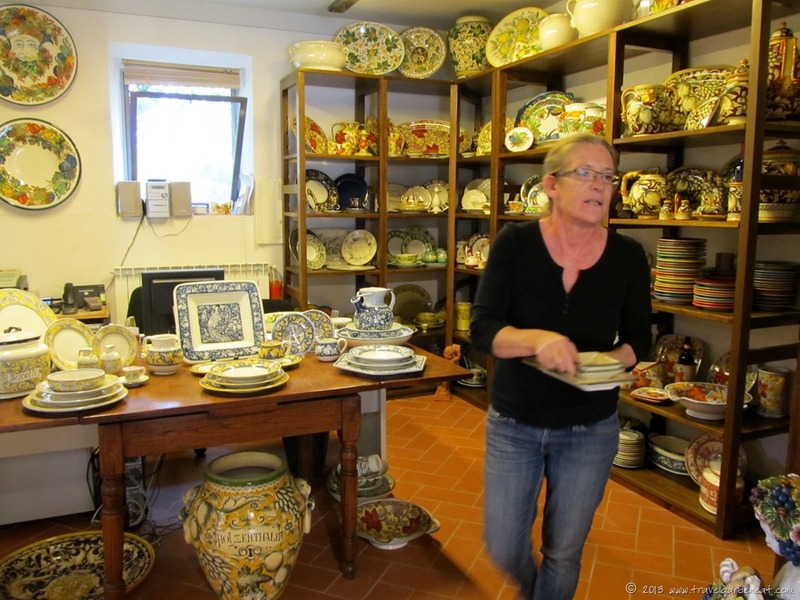 A Tuscan Pottery Gem – Travel. Garden. Eat. Part of the impetus behind starting this blog was to have an outlet to preserve travel photos and stories, and our Italy trip two years ago had enough stories to keep me going for quite some time. As our travels are more limited currently by the stage of life we are at — college visits, college costs looming and the typical juggling of life a family experiences with teenagers — I enjoy periodically dipping back into the digital photo archive to resurrect past travel experiences. Today, let’s return to Tuscany, the Chianti region to be precise, where a gem of a pottery shop turned into a favorite travel memory. Rampini Ceramics was a one-line mention in a travel guide or article I came across while researching what to see and do while in Tuscany. The classic painted pottery can be found in shops throughout Tuscany, but something about the family-owned studio in a restored farmhouse in the Chianti countryside appealed to me, and one of the only items I intentionally sought out as a memento from our special trip was a set of pasta bowls. As we pulled into the picturesque parking area next to the studio and shop, a friendly German Shepherd greeted us, which kept my youngest teen entertained while I pored over the artistry inside. We were fortunate to have the shop to ourselves for much of the time we were there, allowing for extended conversation with Tiziana, who told us about the history of many of the patterns we admired, helped me narrow down my pasta bowl selection, and shared her infectious passion for the art of the pottery that surrounded us. 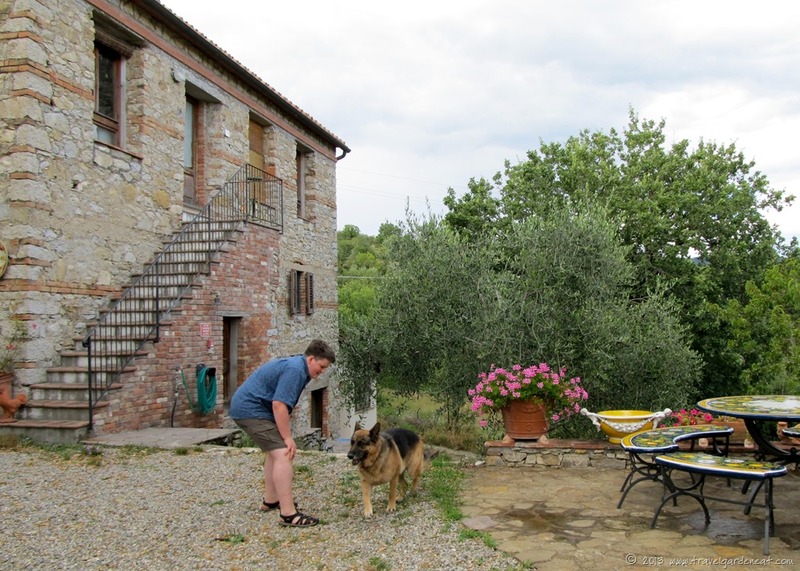 My oldest teen enjoyed practicing his newly-learned Italian skills while talking with her, and she fueled his growing interest in global study by discussing the many opportunities for study abroad in Italy. She was generous with her time and conversation. The results are magnificent. I am reminded daily of that memorable family time in Italy when I see the platter hanging in our kitchen, or when we enjoy pasta out of a painted masterpiece. Rampini Ceramics sells their pieces at the original shop in the Chianti region of Italy, as well as in a store in the city of Florence. Stateside, you can find their work in Denver, Colorado. 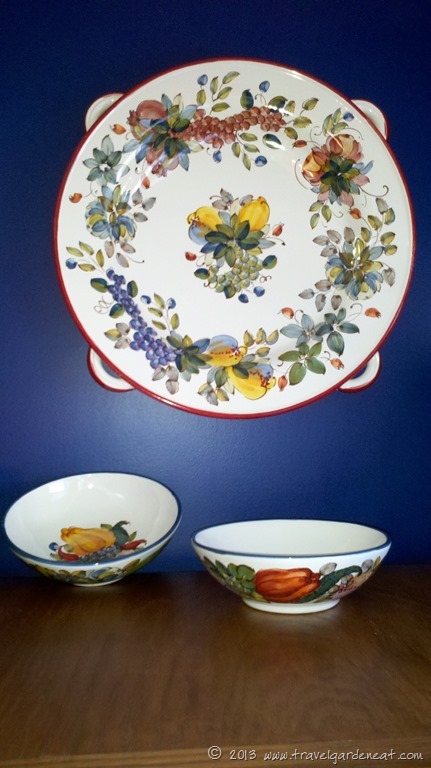 Links to their retail outlets, as well as instructions for ordering online, can be found on the Rampini Ceramics website, http://www.rampiniceramics.com/. Thanks for sharing this. I loved the pottery in Italy and Tuscany, but I missed this pottery place. I notice the Poggibonsi directional sign in the video, so I wasn’t too far from this potter. I staying in Il Borghetto near Poggibonsi. I hope to get back to Italy someday soon. I’ll look for more of your posts on Italy. Thank you, Janice — if you return, this is such a lovely stop to add to the itinerary! I have posted periodically on Italy in the past, but with the daily NaBloPoMo challenge this month, it is a good excuse to dust off some more of those memories. I, too, hope to return some day! Delightful! However could you choose a pattern? And the setting! Husband potter if we only could! Thanks, Ingrid — decided to change up the look of the blog a bit! Do make the time to search out their Denver shop — just amazing pieces.